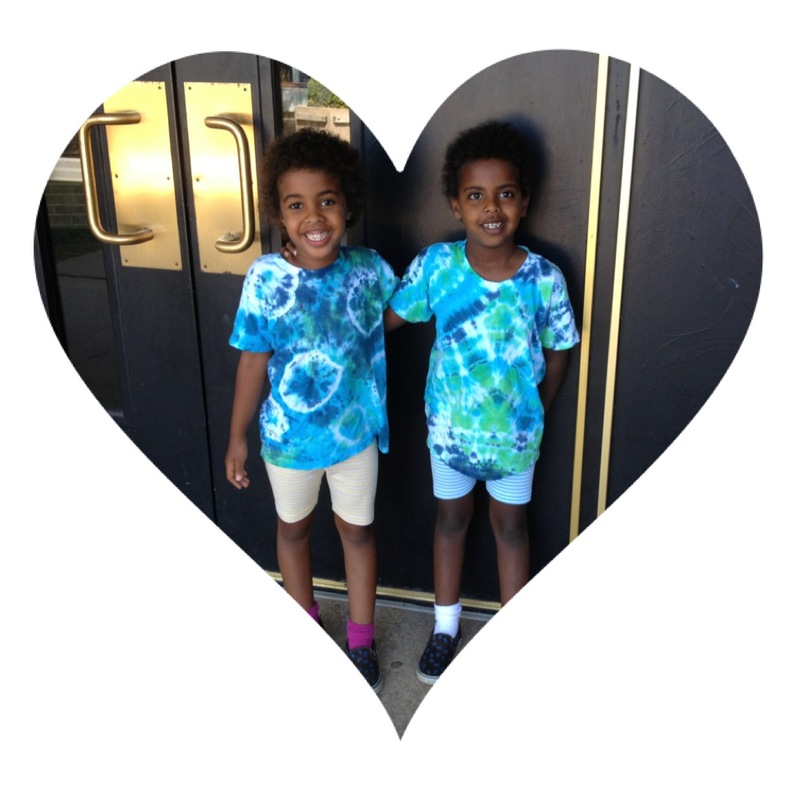 As usual, I am all out of order here, writing about things after they happen, but I loved doing this tie-dye project with the kids so much that I wanted to make a note of it, so that we can do it again. I haven’t actually tie-dyed anything in years, but back in my faux-hipster, super-ironic youth, I used to steal oxford cloth button down shirts from whoever I was dating at the time, and those horrible Lacoste golf shirts, usually in pink or white (I dated a lot of preppy boys. A LOT), and then tie-dye them fuchsia and navy and turquoise, and wear them to the dive-bar I bartended at to cover my college tuition. 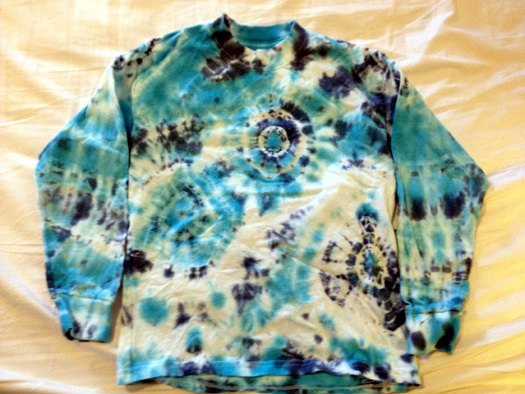 Back then, tie-dye required buckets, loads of that cheap RIT dye from the grocery store, and a ridiculous amount of effort, and they dyes always ran when the shirts were washed, but it is so much easier now! 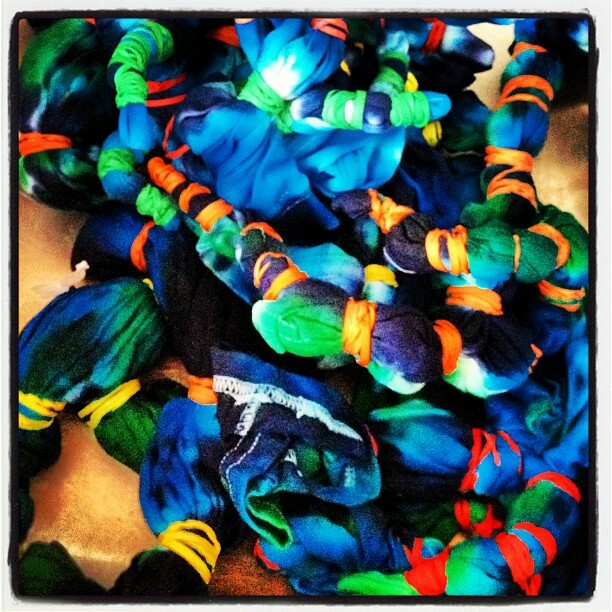 I suspect that back then I was thinking what I was doing was some kind of awesome anti-consumerist statement, but I can’t lie, a lot of the appeal was the horrified looks people would give me when they realized I was tie-dying perfectly good $100 shirts. Ah, youth, I don’t miss you as much as the media tells me I should. Step 1: materials. I bought Tulip brand dye in ‘Moody Blue’, tie dye soda ash dye fixer, and Synthapol laundry soap. If you are following along, these are links to Amazon ***, but don’t buy any of this there – it was much cheaper at my local craft store, all of it. I bought the soda ash and Synthapol because the kids did tie-dye at summer camp, and after two washes, those shirts are faded and muddy, and I wanted our projects to look really good now and 50 washes from now. Step 2: The Tying. My husband and I tied the long-sleeved t-shirts ahead of time, and the pillowcases. There are lots of instructions online for this, but we mostly gathered fabric up into bullseyes, and then tied them several times, then tied the whole t-shirt up into a lumpy thing. The kids could not work the elastics by themselves, so they pointed to what they wanted tied off, and we did it for them. Step 3: Soak the tied garments in a water/soda ash bath. Proportions are on the container, but one bag of that stuff would do at least 3 tie dye sessions. Step 4: dress your children in your husband’s old punk rock show t-shirts, turned inside out so as not to traumatize them with the graphics and/or not to ruin the shirts. The dye goes everywhere, and an apron would not have been enough. We did this outside, on a mesh metal table over the grass so that it wouldn’t matter where the dye spilled. Step 5: The Tulip dye kit is great because the dyes are pre-measured into squeeze bottles – just add water and squirt away! 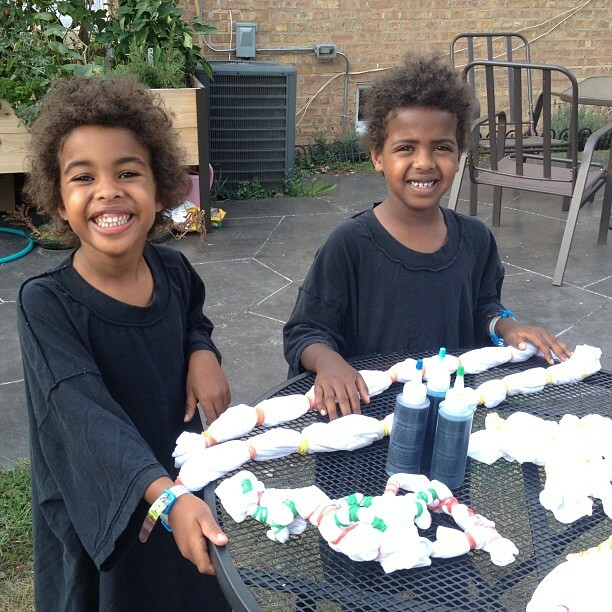 I loved this part, because it was so easy to let the kids play with the dye, without worrying about dipping the shirts into a dye solution, and because it made it very easy for them to handle the dye alone, without me hovering. And we bought a colour kit with just three complimentary colours in it, so that no matter what colours they chose, it would go well together. Step 6: Really, this is just a cautionary tale step. Learn from my mistakes, and make your kids wear gloves. Especially when school starts just a few days after your ‘dye day’. Luckily, we picked our new school colours for this project! Step 7: Once the fabric is dyed, toss each item into a plastic grocery bag, and tie the top to seal the bag. Let it sit for 24 hours, to let the dyes really saturate the fabric, and become very rich and deep. Step 8: One at a time, drop the items in a sink, and rinse with cold water until the water runs clear. Cut the ties off, and rinse the whole garment again, in warm water. Admire your handiwork – the 24 hour ‘rest’ really makes for amazing colour saturation. I had to use a filter to get the full effect, but this is exactly what it looked like coming out of the bag. That’s good, because getting all those stupid bands off will make you hate crafting, projects, and your life choices. Step 9: wash everything in the washer, on the hottest water you can, using Synthropol detergent. Dry as normal. I was extra cautious, and did a second rinse wash cycle and washed a load of dark towels directly afterward, to make sure no dye was left in my machine. I made this! And I kind of love it. The photos don’t do it justice, because I am a crap photographer, but my daughter loves it, and her sister, who got a Dad-made matching shirt, is equally thrilled. 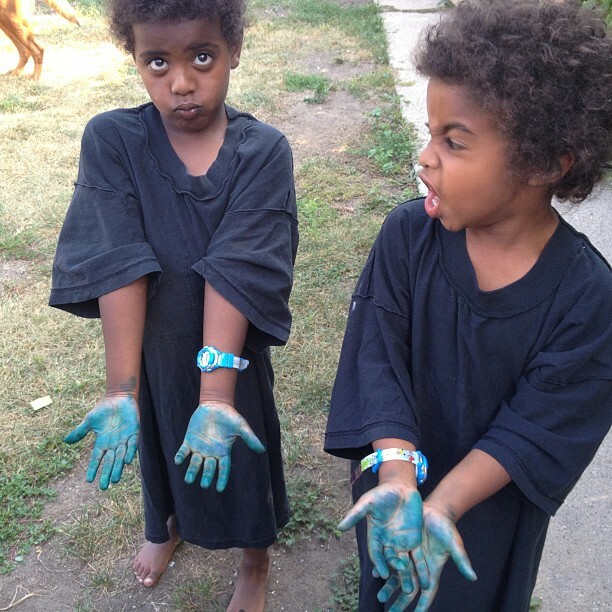 But not as thrilled as they are with the shirts they did themselves. Step 10: Wear your new creation to kindergarten orientation. Be adorable in it, and super-proud that you made it yourself. They actually made those t-shirts all by themselves, minus the washing machine part, the soda ash part, and the actual elastic tying. The design, the colours, all them. And they love these shirts, and the pride is so adorable. I think we are going to tie dye a set of sheets for them next, because I am so tired of pulling white sheets out of the laundry and trying to figure out what bed size they are. And because it would be a great foil for their ‘edging toward Pottery Barn’ room decor. The difference between these shirts, and the ones they did at camp are staggering, in terms of colour-fastness, and saturation. The soda ash and Synthropol really make a difference. This was so fun that I want to buy a bigger kit and maybe make their birthday party next year a tie-dye party with a bunch of their friends. My husband has a lot of ancient punk rock t-shirts, and the back lawn is half dead anyway. Win-win! *** ed note: These links go to Amazon, because Amazon is the most stable in terms of being able to click these a year later and still bring up the right product, but – they are not affiliate links, and also, if you are going to do this project yourself, look at the products and then go to a local art supply store, because the soda ash and Synthrapol were each a third the price of the Amazon list prices. Also, this post is not sponsored in any way by Tulip. I bought the dyes because I wanted to try them,and I really like them.